In a large non-stick skillet (so all the spices don’t stick to the bottom) melt the butter and add the onions. 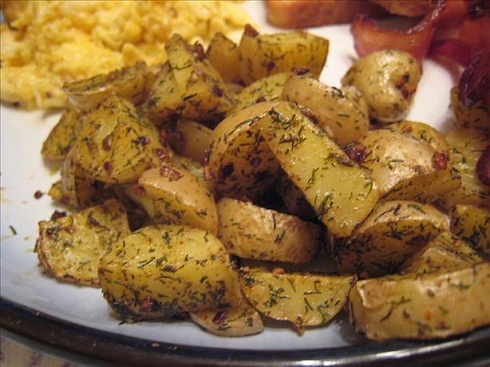 Cook 2-3 minutes, then add raw potatoes chopped to about 1/4 to 1/2-inch dice. Add all of the spices and garlic. Continue to cook on medium heat until the potatoes are cooked through (about 15 minutes). Be sure to taste for salt because these potatoes need more salt than you might think. Serve on the side of a fried egg breakfast.